DeKalb, Ill. — Two weeks at the Exxon-Mobile Bernard Harris Summer Science Camp, held at NIU, have made a group of Northern Illinois middle school students excited to return to class. They are ready to learn more about math, science, energy and their own potential. They had a good start in June when the 48 participating learned about the law of gravity, the power of solar energy and the theory of motion. The students worked in groups to build a theme park that was powered by gravity and solar energy. 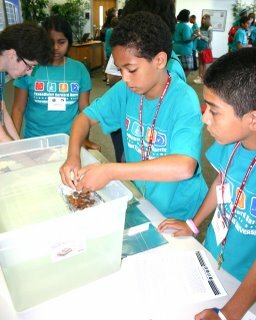 Students at the ExxonMobile Bernard Harris Summer Science Camp experiment with boat building. Click the photo for a slideshow. This is the second year that NIU’s College of Engineering and Engineering Technology has hosted the camp. It is one of 30 colleges and universities across the country that invited the students onto their campuses with the hopes to spark their inquisitive minds, said Mansour Tahernezhodi, the associate dean of the college. On the final day of camp, students used one more piece of technology – the Internet – to speak with camp founder and retired astronaut Dr. Bernard Harris. From his California home he urged each of them to follow their dreams and not let anyone or anything stand in their away.